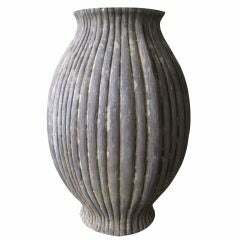 Hand carved from cast cement, a decorative garden urn. Original copper drainage spouts in bottom. Base has a few chips but bowl and decoration in good condition. Note losses to base. Attractive age-appropriate patina. 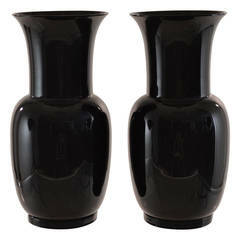 Magnificent pair of black Murano glass urns, signed Venini, Italia, 1978. Pristine condition. Great patina on this cast iron plant stand --aged red and silver paint along with the neoclassical motif of crossed arrows. The well at the top of the stand has a 8.5" diameter. 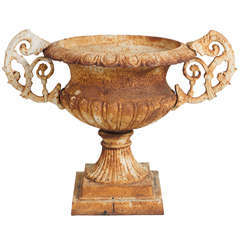 Pair of neoclassical style terracotta garden urns with leaf and gadroon trim in a weathered finish, circa 1930-1950. 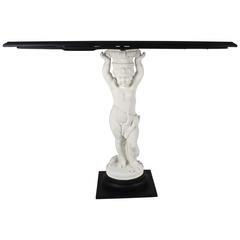 Perfect for your garden, doorstep, entryway, anywhere!! Great aged patina. These only look better with age. 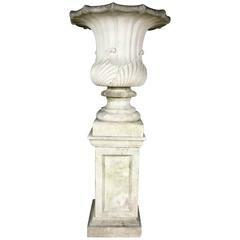 Outstanding English garden urn on classical base.